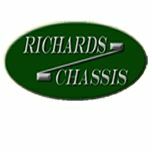 Richards Chassis are made from 2.5 mm British Steel and come Galvanized as standard. Once galvanized our chassis are taken back into the workshop and rectified. All holes are re-drilled and re-tapped before standard suspension bushes are fitted before delivery.